Visual Trading Console (VTC) introduces a next level trade manger module, which is available from version 2.01.07 and in all 3.x versions. The trade manager mechanism is composed of two trade manager layers, which enable truly automated multi-terminal trade management. This short article will explain the various trade manager components and their use in automatic trade management. Trade manager profiles are the foundation of automatic trade management. They encapsulate various trade manager settings such as “initial SL & TP”, trailing & stepping stop, break even parameters plus profit & loss scaling to name but a few. Each profile can be assigned to various tickets (open trades), thus enabling independent settings for every order. 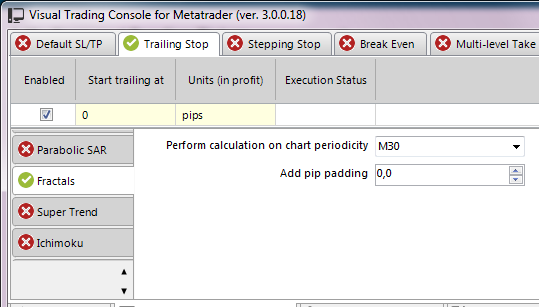 The Trade Manager Profile Editor is used to create, modify and save user defined profiles under unique profile names, which can later be used to manage various trades. Profiles can be assigned manually or automatically to different trades. This article will focus on automatic profile assignment based on user-defined criteria – this is where the Trade Manager Logic comes into action. The predefined trade manager profile name “>> TRADE MANAGER OFF <<” is used to switch off automatic trade management for particular trades. These entries must be placed on the top rows because the trade manager logic will always use the first matching criteria it finds looking in order from the first row to the last row. In the example above, all trading done on the 327983 account number will NOT be managed (all symbols, all trade IDs and all order types). 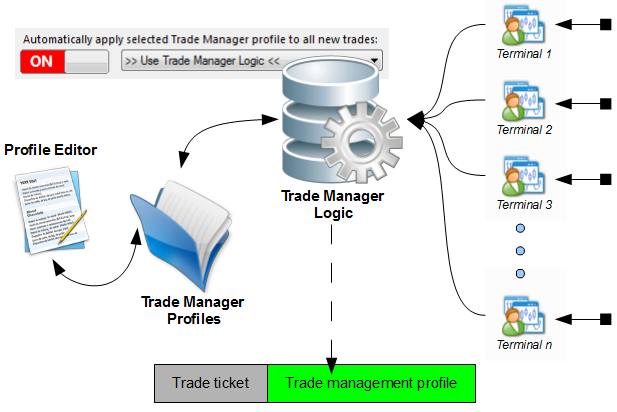 Trade Manager Logic can be tested by entering trade parameters and pressing the [Test] button. The last step is to activate the automatic trade manager and instruct it to utilize the Trade Manager Logic layer for automated Trade Manager Profile assignment. From this moment on, every newly opened trade will be checked by the Trade Manager Logic module to determine the appropriate Trade Manager Profile to apply to this trade so all management functions can be done according to the selected Trade Manager Profile. The program offers more trade management functions than MYFX, but does not have the “social” features of MYFX. Additionally VTC enables managing multiple MT4 terminals. what has happened to fractal trailing stop ? 1. What are Magic (Trade ID) Numbers used for..? 2. Can I get VTC to automatically use a Profile for each Pair? As I have it now the >> Trade manager Logic << doesn't seem to do anything.. I am having to use the drop-down to switch profiles to trade different Pairs.. These numbers can also be used to define advanced trade management scenarios in VTC. This is what Trade manager logic is used for. The “>> Trade manager Logic < <" setting does not perform any actions on its own - you need to define the logic using the Trade manager logic editor. Please send a query to our help desk, if there is a trade manager scenario that you would like to setup and don’t know how to. Hello! I like the features, My question is how much does it cost?